When two smaller baths, a hall and master, were combined, a stylish, spacious and all around fabulous new master was born! The new space has room for a lavish shower, double vanity, as well as ample linen storage. Follow the journey we took with these homeowners to convert their two bathrooms into one. BEFORE – The original baths were located side-by-side, with each bath having a smaller single vanity and small shower stall. The original master bath also had a large, unused jetted tub that occupied valuable space. One option for the homeowners was to remodel just the master bath. While removing the large tub would have opened up space for a bigger shower, it wouldn’t have given them enough space for a double vanity or much needed storage. AFTER – This bathroom has so many great features! Remember the small vanities? 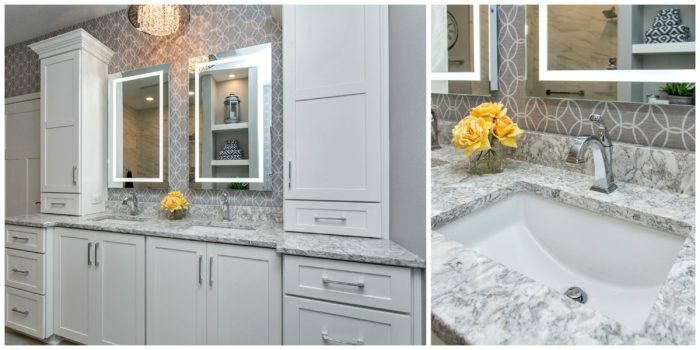 Even the most lovey-dovey couples don’t really want to share a sink … and these homeowners no longer have to with this spacious double vanity. A mix of doors and drawers in the base cabinetry provides plenty of flexible storage, while countertop storage towers keep products close at hand. The vanity cabinets are deeper on the ends, giving the vanity added dimension. AFTER – This shower! I know there’s nothing I can say to adequately describe it, so just look. The two previous baths had the same small, plain shower. This open shower has plenty of space and is easy to access with a wide opening and low curb. 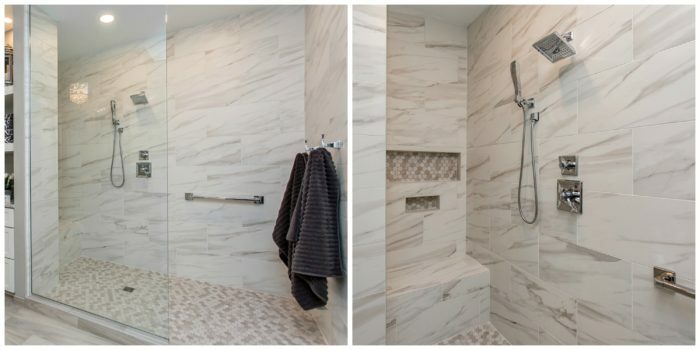 Many times you’ll hear that low curb showers are great for people who are aging and not as agile, but they are also great for kids and anyone else who doesn’t want to hurdle a tub or higher curb. 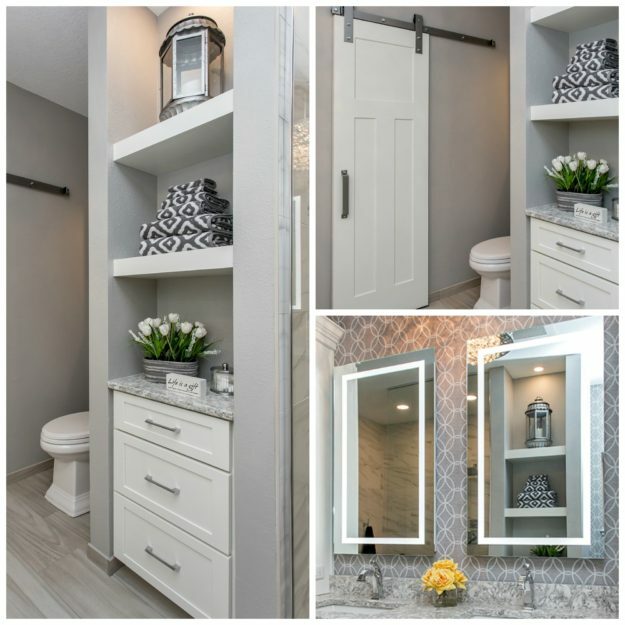 AFTER – This master bath keeps on winning with this ample closet with great space for laundry and linens. And this closet isn’t staged. The homeowners actually keep it this neat and matched. It’s like a Container Store ad, but real! AFTER – Little extras that make the space functionally special: let’s start with the mirrors, which have an LED ribbon border around the perimeter. The LED border provides more lighting – and most importantly – makes you look amazing! The barn door closet door is also worth a mention because while they are currently trendy and look cool, they also solve the problem of having a door swing into the room, and don’t require an empty wall cavity like a pocket door. 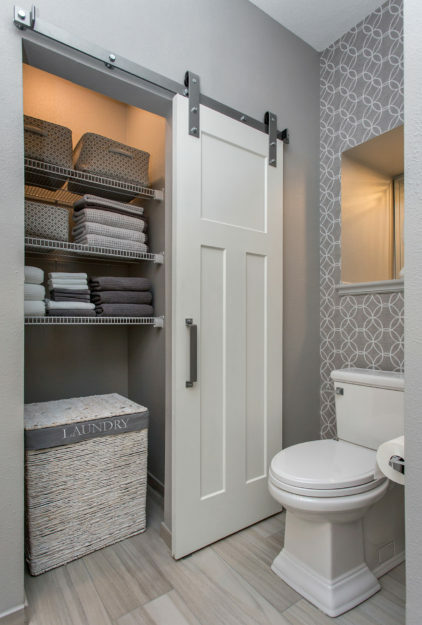 A final shout out goes to the storage niche that separates the toilet from the rest of the space and provides more storage and space for décor, it’s a design extra that’s both functional and attractive. AFTER – Little extras that make the space beautiful: hello, showstopper light fixture! The funny thing is, the fixture the homeowners originally selected was no longer available, but we can’t imagine the space with anything but this dazzling chandelier. On its own, the fixture wouldn’t be ideal above a vanity, but the lighted mirrors provide plenty of light, and overhead can lights illuminate other areas of the bath. 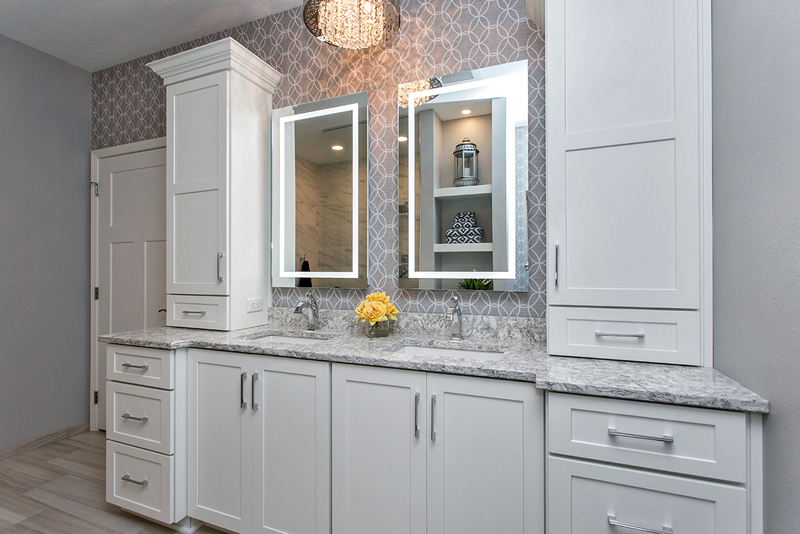 The wallpaper also deserves a shout out because it looks great, provides texture and creates a definite focal point behind the mirrors and in the toilet nook. Finally, the hexagonal tile on the shower floor, and in the shower niche, take hex tile up a notch. Aptly named Arthex, it combines design with classic stone. Regardless of the reason for your remodel, combining spaces or just updating the look, we’re ready to help you get the ball rolling so you can Love Your Home! Schedule a free consultation or attend one of our upcoming seminars.